Three apprentices working on Birmingham City Council’s major housing repairs and maintenance programme have been given a step up on the career ladder earning full-time roles with Wates Living Space. Chris Grainger (19), Charlie Gaston (20) and Nathan Reuter (19) joined the social housing maintenance provider Wates Living Space as apprentices in April this year and have since been employed full-time on the Birmingham City Council contract, joining a 260-strong workforce undertaking housing maintenance programmes across west central and east Birmingham*. Chris from Kitts Green, Charlie from Solihull and Nathan from Kingstanding completed their apprenticeships in plumbing, carpentry and joinery last month and will now help the business maintain over 31,000 properties across Birmingham. The three are the first in a line of trainees to benefit from Wates Living Space’s appointment to Birmingham City Council’s four-year housing maintenance programme, one of the largest of its kind in Europe. Their appointments form part of Wates’ commitment to ensuring training and employment opportunities for the local community as the industry faces a critical skills shortage, said to be at breaking point in the Midlands**. “I’m very excited to be joining Wates Living Space as a full-time member of the team. I now have my own van to work from and have started carrying out plumbing services across the council’s housing. “Chris, Charlie and Nathan have all excelled on our programme and have been given the mentorship to progress into positions of full-time employment with Wates Living Space. 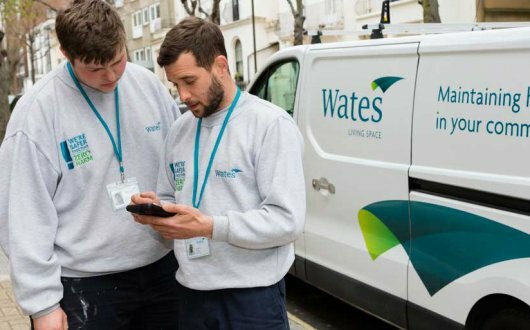 In addition to creating trainee and apprenticeship positions, Wates Living Space has also pledged to utilise the local supply chain to deliver its repairs and maintenance service, bringing an economic boost to Birmingham-based SMEs. This commitment recently saw the Wates host a ‘Seeing is Believing’ tour in the city to promote social enterprises and the social value they deliver. * Details of contract – 12,664 properties in west central Birmingham – including Perry Barr and Ladywood district – and 18,383 properties in east Birmingham – including Hodge Hill, Yardley and Hall Green districts. 31,027 properties in total.